All members of our school community are expected to follow our E-safety Strategy. If you require any help in ensuring your child stays safe online please feel free to speak to any member of staff. Please look at our esafety guides below. Children often don’t know what they’re signing up to when they join Facebook, YouTube, Snapchat, WhatsApp or Instagram. That’s why the Children’s Commissioner have worked with lawyers to create simplified versions of Terms and Conditions for the most popular social media platforms. A wonderful new resource from the office of the Australian e-Safety Commissioner that can be used by schools and parents. Advice for parents and carers with children aged 0 to 7. 1. Use digital devices together: Get involved in your child’s online activities. Have fun, play games and learn together online, just as you would in the physical world. It will then be natural for your child to turn to you if they experience anything upsetting online. 2. Set clear expectations: Clear family rules can help your child have a positive start to their digital life and get the most out of being online. Ask your child to help create some family rules. 3. 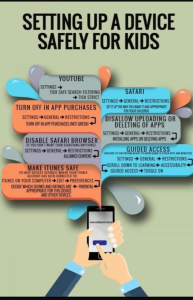 Be informed: Many digital devices, services and content providers offer a range of parental controls. You can choose the type of content and options that are suitable for your child. 4. Establish good habits early on: Both adults and children enjoy sharing moments with family and friends through online images and videos. Starting conversations and good habits early on is a great way to support children in staying safe online. educateagainsthate Practical advice for parents, teachers and governors on protecting children from extremism and radicalisation.